I quickly learned in my nursing experience that my heart is with dialysis patients. People who are living with chronic kidney disease (CKD) are dealing with so much. I can empathize with their situation because see them every week at Satellite Healthcare’s dialysis center in Memphis. I get to know about them – their family, friends and life goals. I love my job. Compassionate care is key to supporting patients through their journey. Part of that is helping them to accept their position and to choose the one of the many dialysis therapy options that’s right for them. A lot of people come in tearful and afraid. But once we sit them down and talk to them, they understand that there are options. We help them choose the treatment that’s right for their lifestyle – whether that’s dialysis in-center or at home. Home dialysis – either peritoneal dialysis, through a tube in the abdomen, or hemodialysis, through needles inserted into a blood vessel – are great alternatives because they improve patients’ quality of life and allow them to choose their own schedules. I have one patient, in his mid-50s, who had had CKD for more than a dozen years and was forced to switch from in-center to home peritoneal dialysis because he didn’t take to the fistula. When I first met him, he was prepared to give up. But through counseling, education and friendship, we were able to together make health choices that were best for him. Today, he feels empowered and he’s thriving. 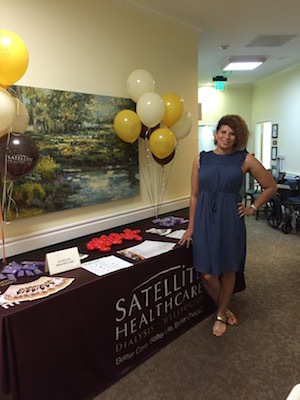 At Satellite Healthcare dialysis centers, we have much higher home hemodialysis numbers than most dialysis centers. I believe that’s because nurses just like me at Satellite are willing and fortunate to work with all patients to choose their ideal form of therapy. It’s truly rewarding to see my patients do well. Joy Barringer, RN, is a Clinical Manager for Home Dialysis at Satellite Healthcare’s Poplar Avenue Dialysis Center in Memphis, Tennessee. She will soon be caring for home patients at Satellite WellBound of Memphis. This year she’s celebrating her 20th year of nursing.